A.B. Richards has been proudly providing ground-level, portable storage containers in the Northeast for more than three decades. However, did you know that containerization has been around for more than two centuries? And that the on-site portable storage units we offer for business, retail construction, industrial or residential purposes are borne out of the standardization of shipping containers in the 1950s by a man named Malcolm McLean? Prior to containerization goods were handled manually as break bulk cargo and shipped via wagons and canal boats. These cargo containers were generally made of wood and arrived at the nearest port warehouse, in all shapes and sizes, to be loaded by dock workers onto the next vessel while previous cargo was unloaded. Eventually, it became apparent a new more cost-effective, reliable and faster way of shipping goods was needed. Enter containerization at the end of the 18th century when coal companies began using containers to ship coal. These containers filled with coal from the mining regions in England were taken by wagons to be shipped via canal barges. It quickly became the preferred mode of shipping and transport, evolving by the 1830s into simple, wooden boxes filled with coal that was transported by railway. By the 1840s iron boxes came into play, as well, and in the early 1900s closed containers came on the scene to make it easier to transport between road and rail. The railways took a significant hit following the Stock Market Crash of 1929, which left many countries without any means to transport cargo. The United States and Europe further developed containerization to not only help the world’s economy during the Great Depression but also to revitalize railways companies during this time. In 1955 McLean, a trucker and the owner the largest trucking fleet in the South and the fifth largest trucking company in the U.S. at the time, worked with engineer Keith Tantlinger to create the first intermodal container (standardized reusable steel box). A year later he patented the first modern-day shipping container, whose design significantly reduced the cost of loading cargo. “In 1956 loose cargo cost $5.86 per ton to load. Using an ISO shipping container the cost was reduced to only 16 cents per ton,” according to an article on the Intermodal Steel Building Units (ISBU) Association website. The global shipping industry quickly adapted to McLean’s design while the rest of the world found increasingly more uses for them. In fact, the modern-day containers’ strong, secure and uniform design pioneered by McLean is still in use today. Today, these stainless steel containers go by many names: moving containers, shipping containers, cargo containers, connex or connex boxes, ocean cargo containers, international shipping containers and ISO containers. They are used for everything from shipping via truck, rail and ship, storage and moving to building homes, stores, schools and other temporary and permanent structures with them. Storage container leasing began roughly 30 years ago as an offshoot of the storage trailer rental business and has since become a dominant factor in the temporary storage market. A.B. Richards entered the mobile storage arena in 1982. In that time A.B. Richards has seen storage containers become widely used by business owners, retailers, and contractors who can easily and securely store inventory, equipment, construction materials and key documents inside of them. In that time, it has also become common for homeowners to conveniently and safely store household items, clothing, and furniture when staging and selling, renovating and repairing or decluttering their homes. 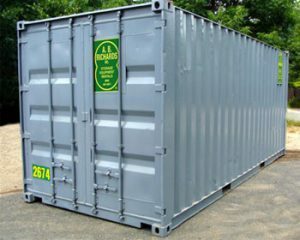 To learn more about our storage container renting and leasing options, contact A.B. Richards today at (800) 597-5971. Our expert team can answer all of your questions, review your specific needs and guide you to the exact portable storage containers that work for you.